Photinia shrubs are members of the Rosaceae family. Relatives include the rose, apples, pears, stone fruits, pyracantha and strawberries. Some Photinia have leaves that are red when they first appear, later fading to green. They are affected by many of the same diseases that plague other members of the Rosaceae family. Crown and root rots are caused by fungi in the soil. The Phytophthora genus of fungi is a common suspect for Photinia shrubs. The plant will begin to wilt, stop growing and become soft in the crown or roots. Control starts with reducing moisture in the soil, as fungi thrive in damp places. Water only when the shrub needs it. Make sure mulch levels are less than 3 inches deep. Only use a fungicide if the exact fungal organism has been identified, as each chemical is manufactured to affect certain species. Bright red spots on the new leaves of Photinia shrubs are a sign of Entomosporium leaf spot, which is caused by a fungus named Entomosporium maculatum. Other signs include brown or gray spots ringed in red on older leaves and spots on the stems. Keep water off the leaves to help control the spread of this fungus and water near the base. Only prune as necessary unless the plant is heavily infected with Entomosporium leaf spot. In that case, prune heavily to help remove infected parts and improve the health of the plant, North Carolina State University Extension advises in "Entomosporium Leaf Spot on Red Tip." Fungicides may also be applied. Fire blight is caused by the bacteria Erwinia amylovora. Oozing cankers form on the trunk, twigs or branches, followed by the wilting of the flowers, branches and twigs, as noted by the University of California Integrated Pest Management (UCIPM) program. They will also turn black. Check to see if the wood has pink or orange streaks, which is a sign of infection. This disease is difficult to control and infected parts should be removed and destroyed. Some plant varieties have shown resistance to fire blight and are preferred in the landscape. When a white film appears on the leaves of plants, it is likely to be powdery mildew. This fungal disease will cause stunted growth and even death of the plant if serious enough. 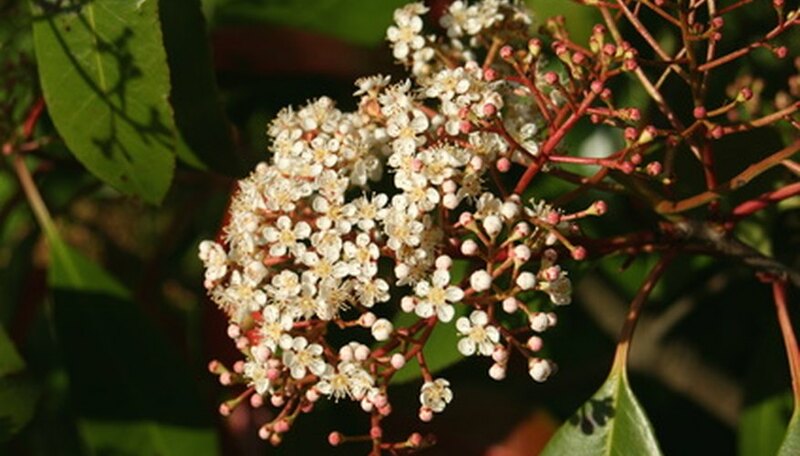 Use a fungicide that is specified for use with Photinia shrubs. Cornell University's Plant Diagnostic Clinic advised removing infected leaves in the fall and planting resistant varieties in its "Powdery Mildew Fact Sheet." Fungi from the Spilocaea and Venturia genera are common causes of fungal scabs in Photinia shrubs. Dark scabby spots will appear on the leaves and may cause the leaves to fall off, said UCIPM. The program suggests picking up infected leaves in the fall and keeping water off the plant. Fungicides are not commonly used.